Photos by Brandon Macz: Madison Park residents listen to a presentation about Seattle's seismic past and present during an emergency planning meeting on Monday, March 18. Madison Park resident and emergency preparedness organizer Margie Carter chats with neighbors. Some will have greater challenges, such as physical disabilities, while others may have desirable skills to offer following a catastrophic event. With heightened awareness about the potential for a major seismic event in the Pacific Northwest within roughly the next 50 years, some residents are already stocking up on supplies and making plans for securing their own homes. But what about planning a neighborhood support network that could improve chances of survival for an entire residential block or beyond? That kind of collaborative effort is ongoing in Madison Park, and was the topic of a special meeting hosted by the community council on Monday, March 18. “Because, when push comes to shove, it’s usually the immediate neighbors that come together to help each other and increase their chances of survival,” said Madison Park Community Council president Karen Kane. Resident Sue Heffernan said former MPCC member John Madrid pulled together a small group of neighbors in 2016 to work on a coordinated emergency preparedness plan, having seen other neighborhoods doing the same. 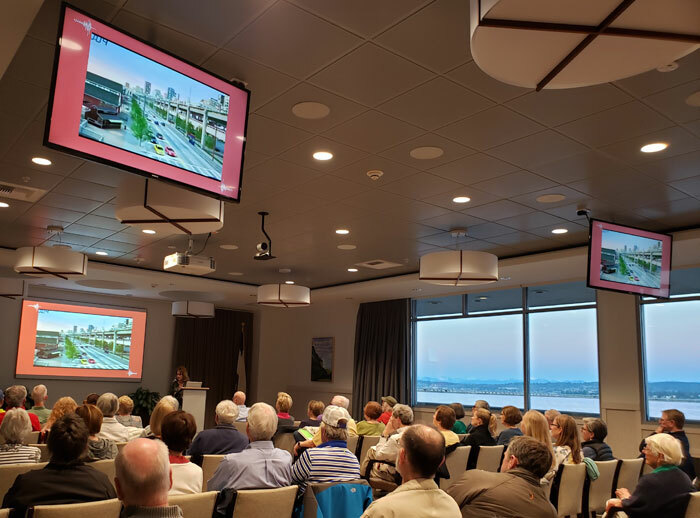 MPCC brought in Sandi Doughton, Seattle Times science writer and author of “The Full Rip 9.0: The Next Big Earthquake in the Pacific NW,” to address the gravity of the matter. Neither the city nor state government is prepared for a major seismic event like what could occur along the Cascadia Subduction Zone, Doughton said. There has been talk for decades about requiring seismic upgrades for the more than 1,000 unreinforced brick masonry buildings in Seattle at risk of collapse, which is estimated to cost up to $1 billion. “The City of Seattle has still done nothing to require upgrades to these old brick buildings,” Doughton said. The Seattle City Council passed a statement of legislative intent in 2018 requiring outreach planning to gauge impacts from new building policies, but no proposals have been made for how to assist with the high cost of the upgrades. If no assistance is provided, critics argue property owners will sell their properties for redevelopment, causing an increase in housing displacement. While the Seattle School District has been addressing its seismically vulnerable buildings over the years, the state has yet to mandate all schools in Washington be surveyed to determine which need seismic retrofits, Doughton said. Doughton said the Cascadia Subduction Zone is where the Juan de Fuca plate runs into the tectonic plates that make up the continent. The plates connect and get stuck together, and pressure builds until they snap out of place, she said, which causes an earthquake, the same kind of subduction quakes that occurred in Fukushima, Japan in 2011, the Indian Ocean in 2004 and Chile back in 1960. United States Geological Survey scientist Brian Atwater, who specializes in studying mud flats, moved to Seattle in the 1980s. Doughton said Atwater determined the area had been hit with tsunamis caused by past subduction zone earthquakes by studying layers of sand. It is believed that there have been 20 “full rip” 9.0-magnitude earthquakes and 20 “partial rip” 8-8.5-magnitude quakes in the last 10,000 years, Doughton said, or one every 250 years or so. The last quake was determined to have occurred 319 years ago, she said. During the four-day Cascadia Rising drill conducted by FEMA, the agency provided estimates that a 9.0 earthquake off the coast would reach 7.0 by the time it hit Seattle, but could result in up to five minutes of shaking. The death toll in the region is estimated to reach more than 8,000, with 12,000 people injured. About 50,000 people are expected to be within range of the tsunami, according to FEMA data. “As callous as it sounds, the tsunami is not going to affect us,” Doughton said. Washington’s Emergency Management Division is working on a 50-year recovery plan through the Resilient Washington initiative, which isn’t getting much attention, Doughton said. Gov. Jay Inslee formed a seismic safety committee last year. “As we all know, his thoughts are elsewhere now,” Doughton said, referring to Inslee’s recently launched presidential campaign. The Seattle Times science writer said Japan and Chile responded to the past major quakes they experienced by adopting stricter building and infrastructure standards, which minimized the impacts when the countries were hit again in 2011. While the exact timing of the next major earthquake is unclear, the Madison Park Community Council is not waiting to get organized. 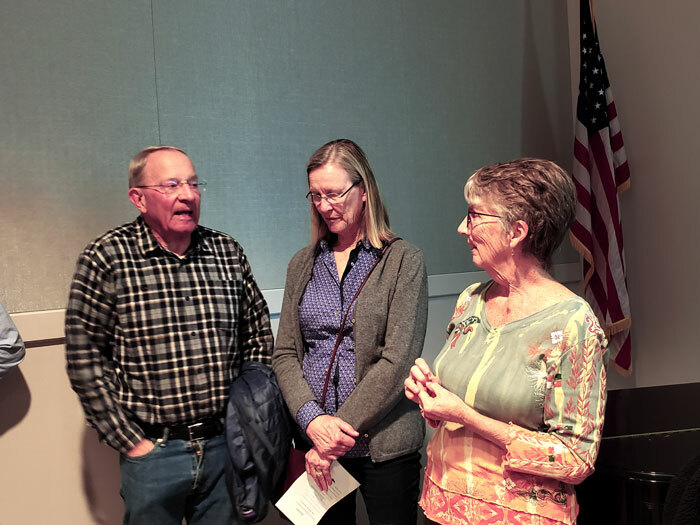 A final exercise before concluding the March 18 meeting was to have attendees break into groups based on their area of residence and share information with their neighbors. Margie Carter, one of the organizers spearheading increased emergency preparedness in the neighborhood, talked to her neighbors about individual and block planning, which will be covered in more detail by a Seattle Neighbors Actively Prepare (SNAP) program volunteer during a meeting 7-8:30 p.m. Monday, May 6, at the Madison Park Bath House, 1900 43rd Ave. E.